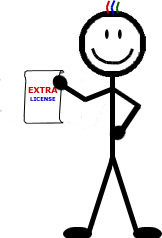 The Extra class license is a must for any amateur radio Volunteer Examiner (VE). What VE hasn't had nightmares of an exam session with too few Extra-class volunteer examiners! Let's face it — a General-class volunteer examiner is as useless as a duck! Once candidates pass the Technician exam, most will try the General exam, even if they haven't studied for it. Might as well, as there's no downside. However, the General-class VE can't give it to them! An Advanced-class VE is slightly more useful, since they can at least administer the General class exam. However, to be fully functional as a VE, you need to be able to administer the Extra exam, and for that you need the Extra class license. There's really no excuse any more — with our courses anyone can pass the Extra exam (even if you're lousy at math!). You just have to be willing to carve out about 30 hours from your schedule. For example, one hour per day for a month will get it done. Already be accredited by one of the Volunteer Examiner Coordinators (ARRL, LAUREL, W5YI, etc.). Already be an active VE, having volunteered in at least three VE sessions in the past twelve months. Currently hold a General or Advanced class license. Don't let the word "free" scare you away. This is not just some scheme for memorizing answers. We teach what you need to know to understand the questions and answers. The email address of your "free trial" account. Your call sign (so we can verify that you currently hold a General or Advanced class license). If you are listed on www.arrl.org/ve-session-counts, http://www.w5yi.org/exam_locations_ama.php or https://www.laurelvec.com/?pg=teams, tell us which state you're listed under, so we can look you up. Or attach a scanned image of your VE credentials. A statement that you have participated as a VE in at least three VE sessions within the past twelve months. Include the date and location of a recent session. This offer is only valid for people who are already active volunteer examiners, not for people who plan to become volunteer examiners. The offer is not transferable. You can't use your VE status to sign someone else up. Our goal is to make you more effective as a VE. Learn about our free bumper sticker offer for VE teams.